The big booking sites use psychological tricks to get you to make a hasty decision. Don't. There's no rush. Much better to talk to the owner and ask all the important questions before you book. Save on commissions and booking fees too, typically around 15-20% but as much as 30% on some sites. Don't take my word for it. Look up StaySavr on Trustpilot or just Google for "StaySavr" and see what people are saying about it. We have our own Safe Renting Guide which gives you everything you need to know about booking and paying safely. 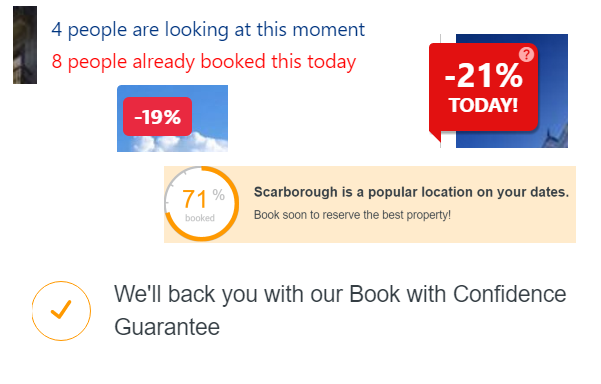 Knowing that your booking is safe is so much better than a flimsy "guarantee". How do I use StaySavr? StaySavr shows you additional information for properties on all Homeaway sites. It works on the best-known hotel booking sites too. The most convenient way is to get our browser extension. Just click on the "Try It Now!" button above. If you can't use the extension, then please use our Instant Look-up page. StaySavr is not an advertising site. It is simply a way to give out your direct contact details on advertising sites where they have been removed. Then you get to know your guests before they book and they can freely ask you questions. Nobody can see who the members of StaySavr are. Data is shown for both members and for non-members whose data has been gathered by research. To fully benefit as an owner, you should join us. This ensures that full and accurate data is shown for your property. It helps us to spread news of StaySavr to the guests. It keeps giving you tips on how to get more direct bookings. It's FREE! The various brand and trading names used on this website are the property of their respective owners. StaySavr is not affiliated with or endorsed by any of the companies mentioned. The service provided by StaySavr website and web-app are for free use "as is" without any warranty. StaySavr is a collaborative project by the owner community. StaySavr is intended to allow guests to make direct contact with accommodation owners. Attempts to use the StaySavr web-app for other purposes including automated data gathering, experimentation, or wilful abuse may result in your IP address getting blocked by our server. Misuse of this facility can result in unreliable data! Does the app collect any data about me? Absolutely not. We add no cookies, nor do we collect data on your activity. The only data transmitted to our server is the occasional owner phone number which the app picks up from a property page. How do I check that the app is working? Just point your browser at any property detail page on one of the HomeAway websites. As contact data isn't avaibable for every single property, you might need to look at 2 or 3 properties before you see the contact details(grey panel) appear. If it is not working, have a look at the question below. How do I enable and disable it? then press Enter. Now you can see all of your installed extensions and for each, there is a checkbox to enable. In Firefox, click on the top-right menu button and select "Add-ons". Now you have a screen where you can select "Extensions" on the left side and then see all your extensions with Disable/Enable/Remove buttons. In Microsoft Edge, click on the top-right menu button and select "Extensions". Now you see a panel with a list of your installed extensions. Click the settings icon to the right of the extension to reveal the On/Off switch and "Remove" button. I don't see any contact details! On Chrome and Firefox, you should see a little globe icon at the top right of the browser window showing that the extension is installed and active. Are you looking at a Homeaway site? StaySavr doesn't do anything on TripAdvisor sites or AirBnB. Try some different properties. We have data for about 70% and you might have just been unlucky. Were you previously seeing the owner details panel? If so, it might be that our server has decided that your activity has been "unusual" and it has blocked access. You can use Live Chat or the [email protected] email address to let us know if this has happened and we can usually restore your access. Maybe your IP address has a "bad reputation" (that's nothing that you've done - probably). Just let us know and we will check it out. Firefox says the extension is corrupt! Please close Firefox and re-start it. Now re-try installing the StaySavr extension and it should work. For any questions not covered above, please use the Live Chat facility. Leave a message if we are not online! When you find an owner who doesn't yet know about StaySavr, please tell them about it! If it stops working, please return to this site to download the latest version. The Email Via 'Mailto:' button may work depending on your browser settings. If it doesn't work, just use the Show Owner Email button. The message goes direct from you to the owner of the property with no interference! Click on our link to download the package. This gives you a file called StaySavr.edge.zip . Double-click on the downloaded file to open your unzip utility. Then extract. This creates a new subfolder: "StaySavr.edge" within the extraction location. In the top "Developer Settings" section, find "Enable extension developer features" and check it. Now close Edge and restart it. Click on the Menu button (...) and then on Extensions and Load Extension. Now a "select folder" dialog comes up. Browse to see your staysavr.edge folder and select it and click [Select Folder]. 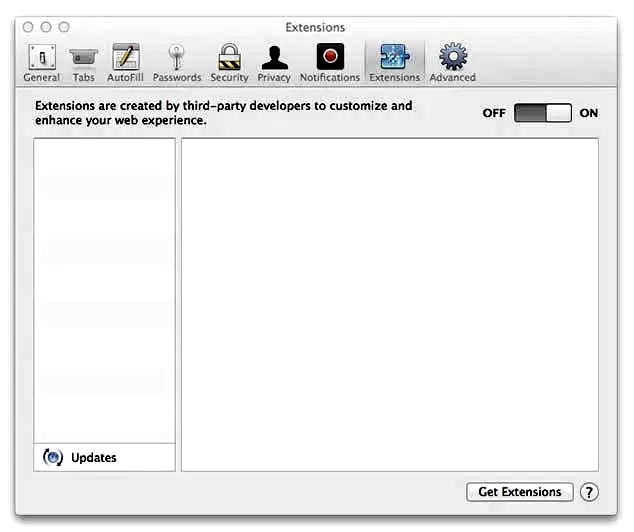 Having installed it, you can switch off the "Enable extension developer features". If you want to remove the extension later, just use the Menu button, then Extensions. Click the blue button above to get a file called: StaySavr-1.1.1.safariextz in your Downloads folder. Drag that file to your desktop. Click [Install] on the dialog ... and there you are! If you only have iPhone/iPad, we can't offer a web-app but we can offer the instant lookup page staysavr.com/look. StaySavr is a collection of tools for allowing guests to get in direct contact with owners before they book. It is created by and owned by vacation rental owners in order to allow rental arrangements that are fair and honest to both parties, without interference from giant corporations. Yes, you're right. Homeaway don't like it! But if you think that we are doing something wrong, please read the "Is it ethical" article under the "Learn More" heading. We think it's healthy to restore this kind of balance to the marketplace. There are so many reasons to Book Direct! 5. Got a question? You won't need to waste time with a call center! StaySavr currently provides direct contact information for properties on the Homeaway group of websites. The history of Homeaway is that it was parasitic on subscription listing sites, buying all of the major ones and then converting to become transactional so that both owner and guest are charged a fee. We do not provide owner information on other sites such as AirBnB which ethically created its own market or TripAdvisor which still offers straight advertising to owners who want it. It also provides website and phone number information for most hotel booking sites. There are many aspects to StaySavr. The main one is the web-app and its close relative: the Instant Lookup page. These take data from the StaySavr database to display the contact details of the owner. The web-app version overlays part of the Homeaway page with its own grey panel containing that information. The StaySavr web-app doesn't need any amendment of property data on Homeaway. It does its work inside the browser, seamlessly making the added data appear to be part of the page. Nobody other than you and StaySavr can see that you are using StaySavr. As an owner or a potential guest, you need not fear that Homeaway can "see" that you are using StaySavr. StaySavr's data is a mixture of data provided by the members, data picked up by StaySavr users while Homeaway was inadvertantly spilling data, and data obtained using AI research methods. We have contact details for about 70% of all properties listed on Homeaway. StaySavr was created by owners and is run by volunteer owners. The costs of running the site are very low and therefore there is no need to charge for StaySavr's core features. If we develop further in the future, then there may be optional features that will be chargeable. The aim of StaySavr is to retain the ability for owners to advertise in a fair and free manner. The aim is not to make money! Members are expected to play their part in letting guests know about StaySavr. This is the main way that our publicity works! If I join, will Homeaway be able to see? Absolutely not. There is no way that Homeaway can tell which owners are StaySavr members. We have several layers of defense on our server preventing any methodical collection of our data. We feed incorrect data when we detect an attack. Even with the complete and correct data, there is no way to tell a member's data apart from the data that we gather by research. We have no lawyer's opinion on this. We have not engaged a lawyer at all, as doing so would multiply our costs at least 10-fold. That illustrates how little money has been spent on creating StaySavr! So, all that I'm saying here is based on my limited knowledge of law and the opinions that have been given to me by other members. Often, when people first see what StaySavr does, they think that we have hacked the Homeaway web server. No. We haven't. We couldn't and we wouldn't! But, perhaps we make it look as if we have interfered with their server. This is because StaySavr works in a user's browser. There are plenty of precedents for browser extensions working against the interest of the web publisher. Consider Ad-blockers (the most popular category of browser extension). Ad-blockers reduce the ability of the publisher to make money out of their websites. Neither the creators nor users of ad-blockers have been subject to law suits. Creators and users are not considered to be law breakers either. Everybody is free to use Ad-blockers. We believe that the same is true for StaySavr. It does indeed work against the interest of Homeaway, but it uses legally collected information to better-inform users. Obviously, each country has its own laws and I can't say categorically that in your country, our actions are legal. However, we don't know of any law anywhere preventing us from revealing owner information to those who wish to rent. We are not so good on regulations! It's hard to say which country StaySavr is based in (I am in one country, other contributors are in other countries, the server is in yet another country etc). Therefore it is hard to know which country's regulations apply. If StaySavr was a registered business, it would have to have a home country. However, StaySavr is just a project, created and run by a number of individuals. It has no legal status, no accounts, no head office, no board of directors etc. It is a project like (for example) the Firefox browser which is created and maintained freely by volunteers around the world. Most countries have regulations governing collection and use of data. In many countries, the kind of data stored by StaySavr would require some kind of registration. We have not registered because to do so would reveal the identity of at least one of our volunteers. Homeaway don't see it quite like that. They sent an email threatening legal action soon after StaySavr started. They claim that we publish misleading information about Homeaway and they accuse us of "tortuous interference". There are a number of reasons for not taking these threats seriously. We have asked for clarification of where we show misleading or defamatory information, but they have not responded. We also know that they are absolutely unwilling to mention "StaySavr" in public, and thus we know that they will not carry out this threat even if they could find out who is behind StaySavr. Homeaway's threats were directed only at the creators / owners of the StaySavr web site. They have not indicated any threat against users of the browser extension. Also, they (or anybody else) are unable to detect use of the browser extension. Homeaway's relationship with owners is different. Owners are subject to the terms and conditions imposed by Homeaway. Again, Homeaway make no specific mention of StaySavr in their T&Cs because they can't use that* word! But they do require their advertisers to not say anything defamatory about Homeaway and to not encourage guests to book outside of the Homeaway platform. If you join StaySavr, then I would guess that you are doing so in order to encourage guests to book outside of their platform, so you would be in breach of their T&Cs. They would therefore have absolute right to remove your listings from their sites. In practice, there has been little removal due to breaches of T&Cs. Certainly it does happen. I know one owner who was removed due to using the word "Exgreedia" in a facebook post. They are very sensitive to damaging memes. Out of the many hundreds of StaySavr members, I am not aware of any who have had their listings removed due to their membership of StaySavr. StaySavr is 90% defence and 10% functional. Right from the start, we realised that we will be under attack and it is our duty to protect the identity of members. There are 3 layers of defence preventing Homeaway from seeing which owners are members. We constantly test the defences and monitor usage of the site and app. Although Homeaway are continuously trying to gather data from our site and to degrade our service, they are having absolutely no success. * Expedia/Homeaway will not mention StaySavr in any communication. If questioned about it, they will say that they have never heard of it. This is the stance that we expected. Expedia's market valuation of 22 billion USD is based on an expectation of future earnings. Those earnings depend on their ability to keep buyer and seller apart. Expedia has no other value. Imagine the reaction of shareholders if Expedia revealed that their business model (both hotel booking and the Homeaway business) was vulnerable to a look-up service that allows direct contact between buyer and seller. I suspect that their stock would halve in value overnight. This is why they are keeping so quiet and must continue to do so. All this and more is explained in our 3 Welcome email messages which you will receive, starting two days after you join. Where can I upload my property pictures? StaySavr exists to provide guests with a way to contact owners directly regarding properties that are listed on Homeaway sites. To answer this question, we need to look at the background: the history of online advertising for vacation rentals and the history of Homeaway Corporation. Here is a quote from Homeaway's own website: "On a sunny afternoon in Austin, Texas, Brian Sharples and Carl Shepherd sat down over coffee and resolved to change an industry. By June of 2006, HomeAway.com was born"
The words "change an industry" are instructive. That is exactly what was planned. Homeaway was founded without any properties to advertise, but it was founded with ample funding from venture capitalists. The plan was to buy up all of the successful vacation rental listing sites, and then to convert the business from an advertising business to a transaction business. It could only work if they could make sure that there was no significant competition left. Thus, the buying spree started in 2005 with 6 major listing sites and then more in 2006 including VRBO.COM. In the years that followed, there were more acquisitions and each of the websites were converted to run from Homeaway's back-end software. During the run-up to selling the business to Expedia, changes were imposed on the owners in readiness for the change in business model. These included removal of links to owners' own sites, removal of email addresses and telephone numbers from the listings and forcing all inquiries and responses to go through their own relaying system. This made it possible to extract payment from each booking as now the guests had no direct contact with owners until the booking was made. Thus, Homeaway turned from an advertising site to an agency, against the wishes of hundreds of thousands of owners and millions of guests. While all this was going on, AirBnB launched in 2008 with a unique business model and achieved spectacular growth. Booking.com, the largest hotel booking site also started dealing with rentals and TripAdivsor aquired a small collection of rentals listing sites. So, Homeaway has no monopoly and faces a serious challenge, particularly from the immensely successful AirBnB and from Booking.com. The result is an advertising war, where these companies are bidding ever-increasing amounts for your clicks on Google Adwords. This pushes up their costs, and means that the amounts charged to both guests and owners are way beyond the value that these companies provide. This is why it is justifyable to stand up against Homeaway and avoid their charges. Without an effort to break the cycle, the charges will continue to spiral due to what economists call the law of diminishing returns. We don't want to fund an advertising war and we don't think that you do either. Diversion pages: a page for your listing which is easily found by people who look at your listing on other sites. The difference here, is that those people can then contact you direct. the Text Disguiser: A tool for both guests and owners to use in sending messages through the Homeaway Platform in such a way that Homeaway will not be able to redact email addresses, web addresses and phone numbers. The StaySavr website is also a source of reference information including the Safe Renting Guide which is indispensable for giving your guests ways to reassure themselves that they are making a safe choice. Members of StaySavr are kept informed of new developments, opportunities and threats through the monthly StaySavr newsletter. Currently, this works. If things change, we will change the advice here. It looks like you're using an iOS device (iPhone / iPad etc). For these devices the web-app is not possible. To view owner contact information, please use our Instant Lookup page staysavr.com/look instead. Web-apps like StaySavr are not possible under IOS. If you have a Mac or another laptop/desktop or android device, please revisit this page using that and you can then get the StaySavr extension!